I am converting a project from a raw esp32 module/MAX 485 driver -> modbus to M5Stack/PLC module. Does the PLC module supply power to the CPU from the 24V input? Is there an RTS Control line for the RS485 converter or is RTS Control automatic? Is there a chip specification for the 485 converter? Which is used? Looks like the 485 driver is a Exar SP3485. Some vendor on Alibaba claims it is max3485esa replacement. What pin is DE - Driver enable? Pin 2 - RE -> ??? Pin 3 - DE -> ??? 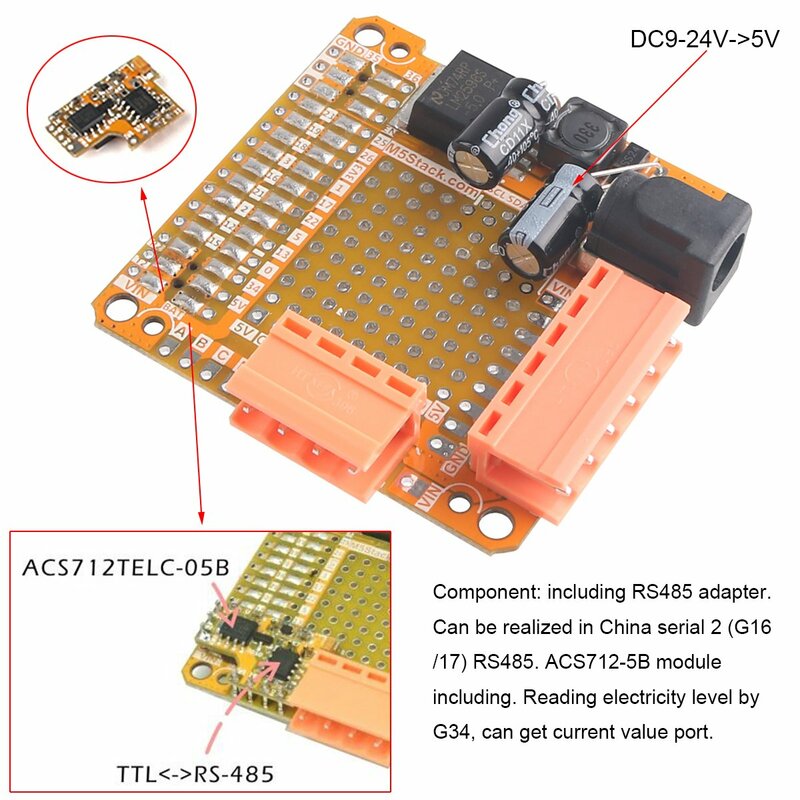 Is there a schematic for the little module? I note that the vendor on Amazon is responsive, but not very technical or knowledgeble about the PLC module. Gave me the schematic for the M5 Core, not the PLC module. They suggested the ILI9341 (display) RST pin is what I was looking for. No. That's not quite right. I think I'm going to have to tie a wire between the DE pin on the 3485 to a free GPIO to get the functionality I need. Hopefully the supplier will eventually provide some official documentation or schematics. I suspect that this might be what you get. Is anyone from M5Stack here? @mkellner Please refer to this schematic diagram. Yes the two power pins can supply the complete module, I am using 12V for the ones I have which will also power a LoRa module. As already answered yes it is automatic, just transmit the data and it is sent out, I am using a Modbus protocol based on one of the Arduino Libraries but it needed a lot of changing to make it compatible with the M5Stack. Works with some Smart Meters I am working with running on the second core of the ESP32 with WiFi and Screen handling on the main Arduino core. You need to make sure you connect all ten connections between the sub board and the main board, there were no instructions with my units so I had to figure them all out. A, B, C and D next to the connector, 5V and GND to the top left of the connector, Vin T2 and R2 on the left side of the main M5Stack connector and if you want to use the current measurement you need to connect pin34 on the right hand side of the main connector. I found the easiest way was to use 0.1" pitch pins and solder them to the small board first and then the main board. @malbro Would you please explain what needs to be changed in Modbus protocol Library to make it compatible with M5Stack?